Relax and enjoy the tranquility of Lakeside Reflections at the Lakeway Resort and Spa. Perched above the shimmering waters of Lake Travis our Texas Hill Country resort provides a variety of sports and recreational amenities for the entire family. We also feature a full service spa - three large swimming pools - whirlpool - a swim up bar and a slide area for kids. Enjoy cocktails with a view at our rustic lower lobby bar and savor creative Southern cuisine at our restaurant with outside seating featuring panoramic lake views. Get energized in our state of the art fitness center or set sail for a day on the lake from the marina. Lakeway Resort and Spa offers a fantastic Kid Zone for families complete with arts and crafts and games. Center your Texas Hill Country getaway at our beautiful lakeside resort and discover majestic Austin accommodations in a rustic setting that will inspire your senses and stir your soul. Vistas BallRoom: Suspended 150 feet above Lake Travis with wrap around terrace, vaulted ceilings and dramatic floor-to-ceiling windows. Rio Grande Ballroom: Located at the lobby level, within easy access of guest room floors. Colorado Ballroom: It is built to breakdown into three smaller rooms, each with its own type of pre-function space. Boardroom: Best for in-depth planning and strategic meetings with a private break or working lunch setup. 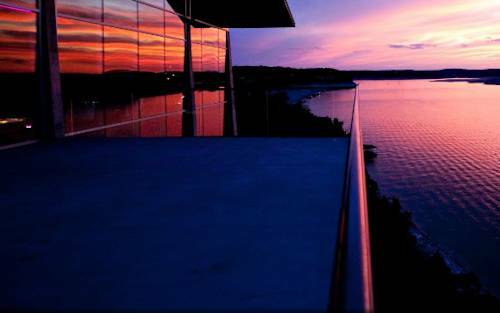 Lakeway Resort and Spa overlooks magnificent Lake Travis and is located 18 miles northwest of downtown Austin and 40 minutes from the Austin Bergstrom International Airport. Nearby wineries marine recreation nightlife and championship golf beckon. Enjoy water sports at our marina with a fun Kid Zone and luxury spa to make Austin a vacation destination all its own. Stunning decor and unparalleled guest services have made the Lakeway Resort and Spa an award-winning legend once again.